Elle is published in the US by Hachette Filipacchi Media U.S., in Canada by Transcontinental Media. The first UK edition was published in November 1985. All the winners of America’s Next Top Model from cycles 3-6 have each appeared in a fashion spread shot by fashion photographer Gilles Bensimon, including Eva Pigford, Naima Mora, Nicole Linkletter, and Danielle Evans respectively. 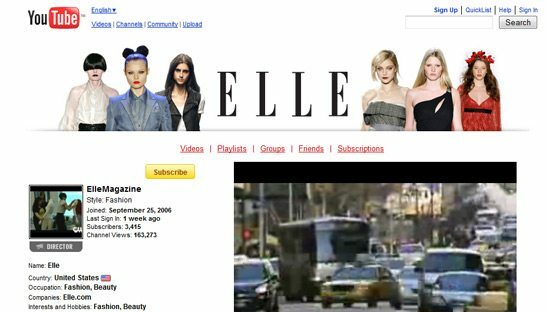 Soon after we finished the ELLE myspace design, Hachette asked us to design there YouTube page. We were happy to do so. Luckily they are approved for a advanced You Tube account, which means it can have a custom top area and other custom areas that the basic YouTube page doesn’t allow. We based the design off what we did on the myspace page. ELLE Magazine is very impressed with all the work we have done for them (see testimonial below).